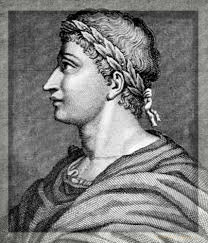 The Metamorphosis, written by Publius Ovidius Naso in 8 A.D., is a collection of classical Latin Roman poems depicting Roman mythology and the mutability of the human condition. The collection is one of my personal favorites to read and to translate in particular for its creative articulation and attention to human transformation, indeed transformation the human person undergoes through achievement and failure. It is also a collection of poems that contain for me profound philosophical insights into the shiftingness of human personhood, indeed the flux of the world where no one rests but in continuous process of change captured in both directions that releases and punishes the human persona. The masterpiece is definitely worth a read. The online text of the Latin text of the Metamorphosis. For the English text I recommend the Metamorphosis, Translated by A.D. Melville and with an Introduction and Notes by E. J. Kenney, Oxford UniversityPress, 1998.